India, the fifth startup nation in the world, has enriched its startup ecosystem with strong startup incubators. These incubators are companies or organisations that lend a strong support to the startups, beginner companies and small & medium enterprises. With the Central government taking a keen interest in the startup revolution and insisting on creating a conducive atmosphere for it, the incubators have given birth to many successful startups in many fields. They not only help with investment but also with their connections with state governments, prospective collaborators and others, and encourage innovation. Coming out of these Innovation labs are many startups working in the field of traffic too. The increase in population and the severe load on road, rail and air demands that we go in for innovation and introduce newer solutions to newer and/ or ever challenging situations like road safety, traffic management, toll management, parking and guidance systems, security and many more issues. 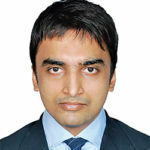 And many start-ups have been entering the fray to alleviate our fears on the topics mentioned above. Keeping this in mind, a special Innovation Zone has been created at the TrafficInfraTech and ParkingInfraTech Expos. This is the zone for companies that are coming up with innovative solutions. This is the place for them to showcase their new products and services to government representatives and prospective buyers. This is the place where a few of them are launching their new products. Founders of a few startup companies providing parking solutions and road marking machine speaks with Vidyottama Sharma about where their idea for the start-up came from, the challenges they faced in launching it, the solutions they provide, technology they use, future aspects of their growth, their plans to go beyond their state and the country, their target buyer and their expectations from TrafficInfraTech and Parking InfraTech Expos. The idea itself — of App based parking – is not new to the world. It is popular in all the developed nations across the globe but India has a real need for it because the current infrastructure does not support the increasing demand. The ratio of available parking spots to the number of vehicles is very skewed and this is where I could identify a need, a need which required a solution that could alleviate the problems faced by people who own cars. team from ground up. Not that it is any easier now, but that’s the life of a startup, where you fight new fires every day and solve them on the go. We provide a mobile based application that gives the convenience to customers to pre-book their parking. Finding parking is always a pain point wherever you go. We have developed a simple, easy to use solution which can be integrated with any existing pay and park lot without any modifications to current infrastructure – thus providing an additional revenue opportunity to parking lot vendors and ease of pre-booking parking spots to our end users. The technology we have used is a mobile based application which is available both on Android and iOS. When a customer downloads the mobile app, he can search for a parking location, leveraging google map. He can enter the time at which he wants to park the vehicle. 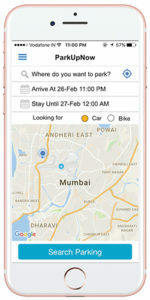 Based on these search criteria, the app will show the parking locations near his search point and the customer can proceed to make a cashless transaction using payment mechanisms such as wallets, debit cards, credit cards or UPI (United Payment Interface). The parking lot vendor receives the notification when the transaction is made. The whole transaction can be done on a prebooking basis or in real-time. solutions for parking via mobile apps. We are also looking to increase our footprint to other cities in India where this technology can be deployed. 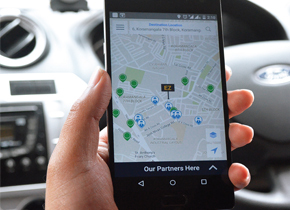 Our mobile app caters to end customers who are looking for parking across cities. The buyer is anyone in the vicinity of our listed site looking for a parking spot. TrafficInfraTech and ParkingInfraTech are platforms where we will get an opportunity to network with important players within our industry. These will also help us identify opportunities for providing complimentary app-based solutions and expanding our product portfolio through strategic partnerships. We are also looking to showcase our solution to industry experts, obtain first-hand insights to improve our offering and also identify new business opportunities. Parking is a problem that everybody encounters every day. We ourselves faced this problem when we had to take our cars or bikes to work and often found ourselves waiting in a long queue to enter parking lots at malls or in the market over weekends. This got us thinking as to how much of a problem this must be for everyone.